Panaji Residency Goa a GTDC Hotel Goa is located overlooking the Mandovi River Goa, Panaji Residency Goa is a fine budget hotel run by Goa Tourism Development Corporation Goa (GTDC). 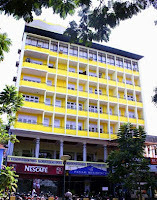 Panaji Residency Goa offers fine accommodation facilities. There are 45 rooms in the hotel. Ruchira is the multi-cuisine restaurant that serves a mouth watering array of delicious fare and the best liquors at its well-stocked bar. Panji residency is 30 kms from Dabolim Airport, 12 kms from Karmali Railway stations, 36 kms from margao railway station, 20 kms from Tivim railway station, 30 kms from Vasco railway station and just 1 kms from KTC bus stand. A short stroll across the road and over the New Patto Bridge will bring you to the river cruise boats which will take you on an unforgettable journey up and down the tranquil Mandovi River. The Adil Shah Palace which housed the Secretariat of the Government of Goa is another short stroll to the left. Further in is the calm buzz of the church square dominated by the Immaculate Conception Church. Half a minute’s walk away is the Jama Masjid and two minutes away from the masjid is the Mahalaxmi Temple.